When I was planning the dessert for our Valentine dinner I wanted something very special. I tried to think back on the most memorable desserts I have eaten in restaurants over the years and the one that immediately came to mind was McCormick & Schmick’s Chocolate Bag. It is totally a decadent treat that MUST be ordered if you ever eat at this establishment. The creation starts with a molded chocolate container in the shape of a small lunch bag. 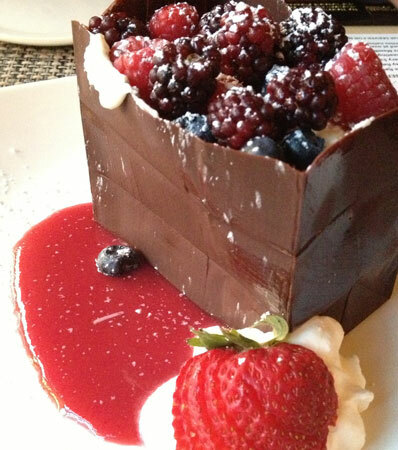 It is filled with a generous amount of white chocolate mousse covered with assorted berries. Pure heaven! I knew that this work of art was way beyond my chocolatier skills but that did not stop me from doing some research and trying my hand at some chocolate cups of my own. 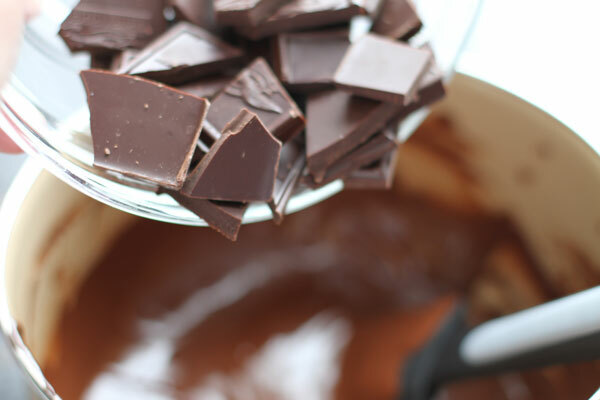 I found several sources of information and tutorials about working with chocolate and several mentioned “tempering” the chocolate which was something I had never heard about but as I read more I totally understood what they were talking about. 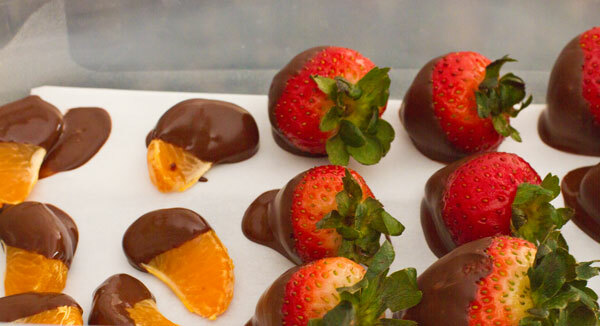 Have you ever dipped strawberries in chocolate and when the chocolate dried it looked grey? Tempering chocolate keeps the cocoa fat from rising to the surface and “blooming.” Tempered chocolate is shiny, glossy and snaps when you break it, it is the secret to professionally made chocolate. According to the multiple sources I checked, there are only three steps to tempering chocolate. It was recommended that you start with at least a pound bar or chunk chocolate. I used Ghirardelli Semi-Sweet Chocolate baking bars. 1. 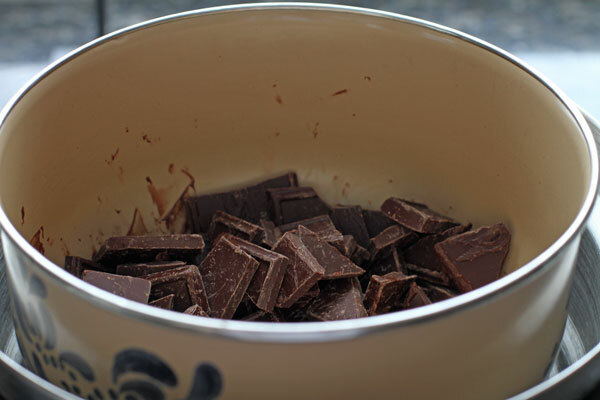 After breaking the bars into smaller pieces, I put 3/4 of the chocolate into a metal bowl over a pan of boiling water (if you have a real double-broiler that is perfect) and melt it to a temperature of 109-112 degrees. (115-118 degrees for dark chocolate). 2. 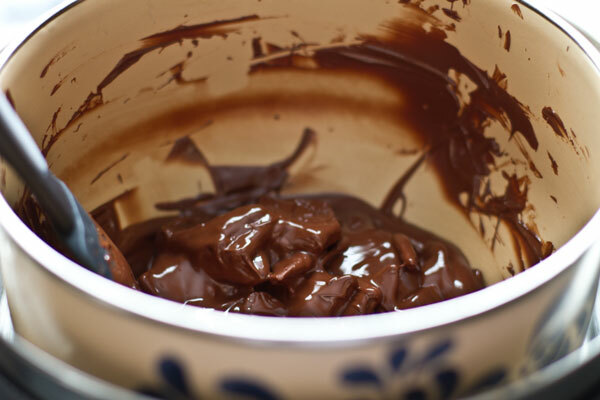 When the temperature is achieved, remove the chocolate from the heat and stir in the remaining chocolate which will bring the temperature down. Keep stirring until the temperature reaches 84 degrees or less. 3. Then move the chocolate back to the double broiler and let the temperature rise again to 86-88 degrees (89-90 degrees for dark chocolate). Now your chocolate is tempered. At this point you must move fairly quickly to work with your chocolate while it maintains the perfect temperature. 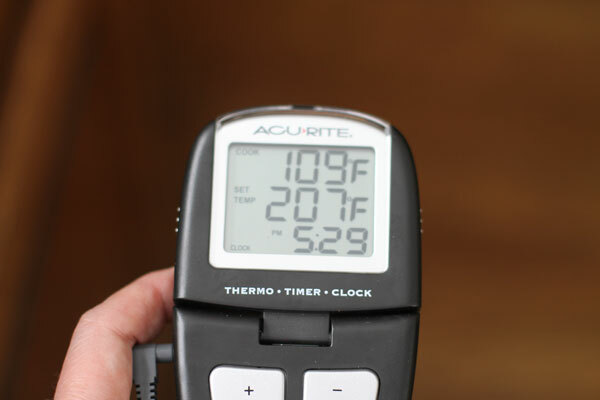 If it drops below the 86 degree mark you can move back to the double broiler to gently warm it back up, but do not let it get above 91 degrees or you will need to start the process all over again. 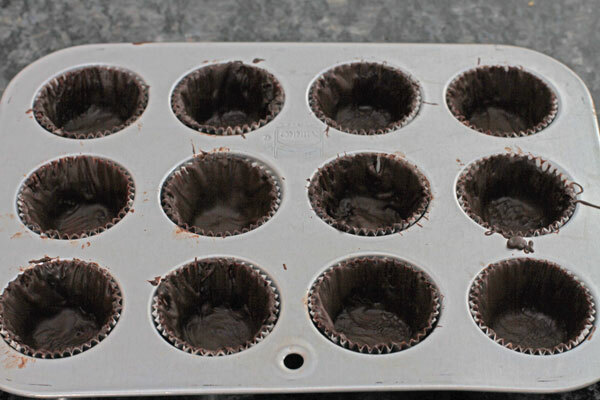 Before I started melting the chocolate I had laid out mini muffin cups in a small muffin tin. When my chocolate was at the correct temperature I used a small paint brush and painted the chocolate up the sides of the muffin papers. I was working very quickly and did not stop to take pictures of this step in the process. By the time I was finishing these twelve small cups the chocolate was getting too thick to easily paint. This is what they looked like when I was finished. Not perfect by any means, but you get the idea. I threw the pan in the fridge to let the chocolate harden. In the meantime, I had lots of chocolate leftover so I moved it back to the double broiler and begin pulling out all the fresh fruit I had in the house. Then I started dipping……. My oh my, this part alone was worth all the effort. After about an hour I pulled the cups out of the fridge and easily pulled the paper off the chocolate. 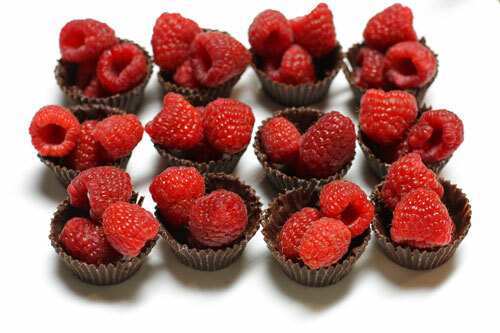 I stored them back in the fridge until the night of our Valentine’s dinner then I piled each of them with fresh raspberries. They were the perfect treat to eat alongside the White Chocolate Raspberry Cheesecake. I need much practice to get this process perfect but I can not wait to try this again. 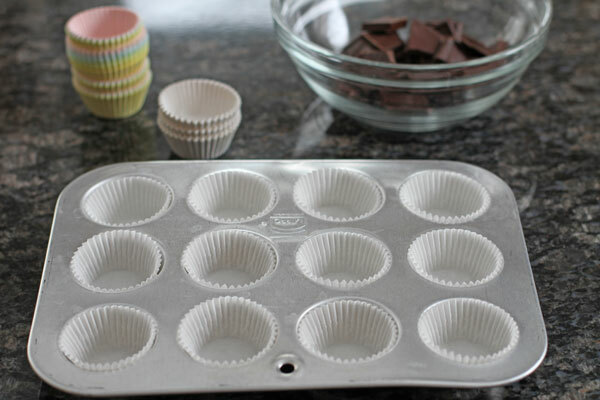 Next time I am going to use full size muffin papers, then make some raspberry mousse to go inside. Maybe eventually I will even try those chocolate bags. You are definitely tempting me!! These look delicious! Thanks so much for sharing at Simple & Sweet Fridays.